09.16.10 POTD, originally uploaded by Sarah (SarahDanyelle). 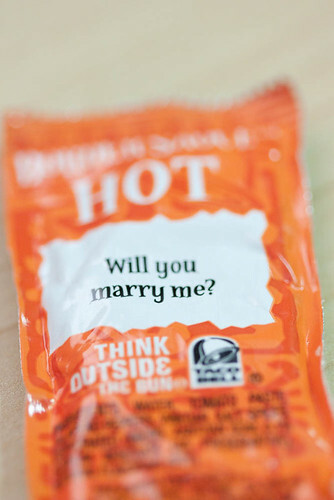 I love the things that Taco Bell writes on their hot sauce packets. Today I got three; Will you marry me, This space for rent. Inquire within and At night the sporks pick on me. Since I am doing bridals tomorrow, I chose to photograph the will you marry me one. I want to say yes, but I think it's illegal since I am already married.